We have had to so many questions about our Hobie Holder that we’re going to try to answer as many Hobie Holder Performance questions as we can for you now. 1. I hear the Holder is a bit tippy, is that true? Yes- It can be a bit tippy in heavier wind. The more people/weight you have on the boat the less tippier it will be. The boat will perform better when the weight is more toward the bow and less at the stern. 2. How many people can fit in the Holder? Surprisingly, it can hold a lot of people. Comfortably we can fit 4-5 Adults. We have had a family of 6 ages 4-18 with 4 children and three adults on board before. It was a bit tight, but we made it work. 3. Is it hard to tow? Nope, the boat only weighs 265 lbs, so just about any medium sized and up car with a hitch can tow this boat. 4. How long does it take to set up and take down? This boat couldn’t be more simple when it comes to setting up. We have timed ourselves a couple of times and between my daughter and I it takes about 15 minutes to set up from trailer into the water. It takes about 12 minutes to take it down once out of the water. 5. 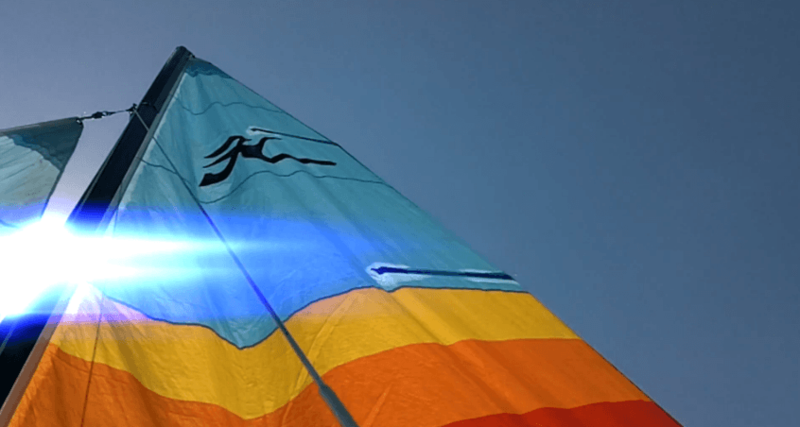 Hobie Holder vs. Cyclone 13…Which is Better? Whenever we get asked this question, the answer is always objective and opinion-based. If you asked another fellow sailor the same question they may give a completely different answer. Knowing that, overall we’d say we enjoy our Holder better than the Cyclone. The Cyclone was a fun little boat, we were much less experienced sailors back then and if I get that chance, I’d love to take it out for a spin again and see if it’s any different than what I remember it being. Both are a bit tippy, but the Cyclone seemed tippier than our Hobie Holder. The holder’s rig and set up is more maneuverable and simpler than the Cyclone 13. Of course these are minimal differences. The Cyclone weighs much less than the Holder (148 lbs vs. 265 lbs). Less weight means less stability, but it’s easy to trailer and carry on to the beach if needed. Again, all in all, the Holder seems to be more fun, more stable and roomier. Here’s our latest video. It’s various clips of us sailing the Holder out on the water. If you have more questions for us about our Hobie Holder feel free to leave it in a comment or send us an email.